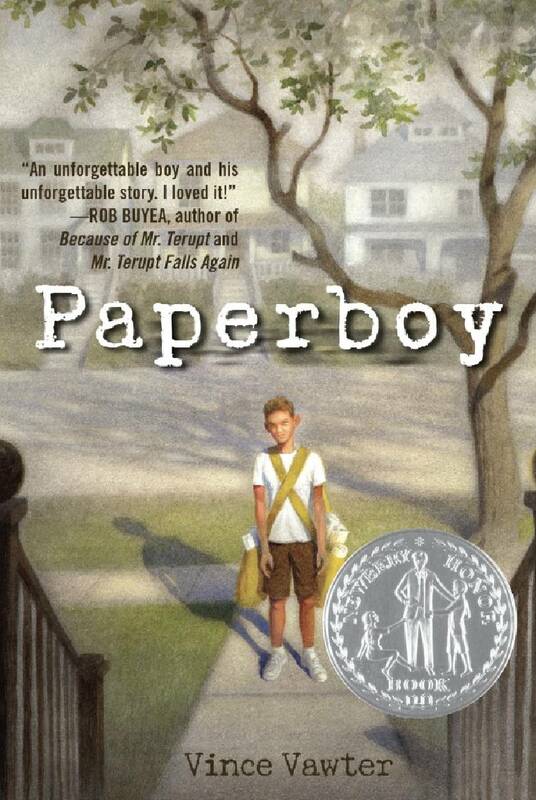 Cover of "Paperboy" by Vince Vawter. Career newspaperman Vince Vawter always knew he'd write a book based on his childhood. What he didn't know, of course, was that the book would be hugely popular, published in eight languages and win major awards, including being recognized with a Newbery Medal. Nobody is more surprised by the book's success than Vawter, 69, who retired in 2006 after a 40-year newspaper career in which he started as a sportswriter in Arkansas, had a stint as managing editor of the Knoxville News Sentinel from 1988 to 1995, and ended in Indiana as president and publisher of the Evansville Courier & Press. Vawter's semi-autobiographical "Paperboy," published in 2013, is about an 11-year-old boy living in Memphis in 1959. The boy, who stutters, takes over his best friend's paper route for a month, forcing him to communicate with folks on the route. "It's about the boy finding his voice. It's certainly not that he was cured of his stutter, it's about him finding his way to live with it," says Vawter, who will speak Friday to seventh-graders at The McCallie school. Vawter, who still stutters although it's barely noticeable, grew up in Memphis and, for one month in 1959, took over his best friend's paper route. Like the character in his book, Vawter was forced to communicate and overcome his fear of talking with people. "I always knew I would write this book. I wanted to tell my story," Vawter says. "I didn't know if it would be published or if anybody would read it. As soon as I retired, I started writing." And, yes, the book strongly addresses stuttering. "It was the driving force of the book," Vawter says. "It was a tough way to grow up. The life of a young person who stutters is so lonely. I wanted to make sure that young people who stutter know that they're not alone." It's a subject that was not discussed in his own home. An only child, Vawter says that, though his parents supported him, they never talked about his stuttering. "It was like the elephant in the room," he says. "It didn't bother me then. I see now that it was exactly the wrong approach. We shouldn't have tried to keep it hidden. It should have been brought out in the open. "Now I realize that the hiding of it was probably one of my biggest problems in that I would try to not let myself stutter. I would not let myself be who I am, and that haunted me until I found my voice. And then it didn't matter anymore. I kind of wore it like a badge of honor." Vawter says he doesn't like to say his stuttering is cured. "Cured is not a word that should be used with stuttering," he says. "I think that you find your voice and you overcome it. I still stutter some now, but what I enjoy the most these days is going around the country, talking to mostly young people. But I will talk to anybody who listens." Margaret Granbery, middle school librarian at McCallie, says it will be Vawter's second visit to the school. "He came last year, so we knew he'd do a quality presentation. What's extra great is that all the seventh-graders read his book over the summer," she says. "They've prepared questions." Meanwhile, the retiree who's anything but retired these days is finishing up a yet-to-be-revealed second book. It's not a sequel to "Paperboy," he says, but the book is "very real." "In some ways, it is like 'Paperboy' because it's a true story turned into fiction."